The link between your university and Spain. Centro MundoLengua takes care of everything. We act as the liaison (and so much more) between your university and our partner universities in Spain. You will gain time and avoid unnecessary bureaucracy. At Centro MundoLengua, we understand that selecting the best possible mix of courses is a key decision to make. We work side-by-side with you to narrow down the wide variety of courses, in an effort to develop a targeted curriculum for your students. Centro MundoLengua has a strong network of contacts with companies, private and public institutions, and NGOs to develop the best possible and personalized company visits, community service, and internship activities for your students. Some fields of specialty include Medicine, Aeronautics, Law, Business, History, Sports, Marketing, and Sustainable Energy. Our professional and friendly staff is available 24 hours a day in case of any problems. Whether a student gets sick, is having a problem with their classes or homestay, or is simply “homesick”, Centro MundoLengua is there to resolve the issue. Centro MundoLengua has a group of trained professors, specializing in History and Spanish Culture. These are the same professors that will lead your students into the streets, as they explore the many monuments and places of interest. These are the same professors that will lead your students on excursions to other cities in Spain. Visits are conducted in a dynamic and interactive fashion, and, we will do all the planning from entrances, to transport, to providing guides. During their free time, the accompanying professors can pursue their research in-situ, often relying on the help of Centro MundoLengua with local connections. 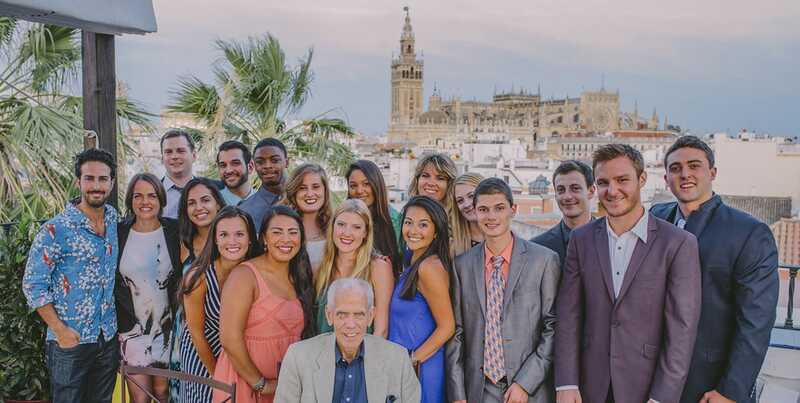 In certain cases, they also have the opportunity to teach their classes while in Spain as part of the overall university program. “I began working with Centro MundoLengua in 2009. Our program grew from 1 student to 23 in a short time span. There is such personal attention from the staff at Centro MundoLengua. I know that each person knew my students and me personally. We had daily contact about the program details and the individual student’s needs. I never had one student return who not only could not wait to return for another experience in the summer or semester, yet did return for another study abroad. I feel the success of Centro MundoLengua is due to the fact the majority of the staff are Master degree level teachers, and have studied abroad themselves. They can multi-task, teaching and arranging programming and travel, which affords them the opportunity to really engage and challenge each student to his/her potential, and yet socializing with them so that they fully adapt and immerse in the culture”. Ingrid K., Christopher Newport University. “I just wanted to write you a little note to express how much we enjoyed working with you and truly appreciate all your dedication and commitment to making our journey a successful one. You are a very special person and became the catalyst for our success in Spain. We could not (ever!) have come away with the experiences we did without you and all your efforts. I cannot put into words how thankful I am to have worked with you during our short time together. Thank you Arantza and I hope Centro MundoLengua realizes how lucky they are to have someone like you on their staff. THANK YOU!”. John B., Monmouth University. “Seven years ago, when we were searching for the best program in Spain for our students, we encountered Centro MundoLengua. There are many reasons why we chose to start our partnership with Centro MundoLengua, among them are: they are personable, professional, friendly, efficient, accommodating, understanding of our needs, and most importantly, they care about us. Centro MundoLengua takes care of arranging the classes, the homestay families, the cultural activities, trips, and they even help us with things that go beyond their call of duty. They are the perfect liaison between us and the local universities and any other institutions. All the people that have taken students abroad have experienced the many challenges that one may faces while abroad, but I can assure you that having Centro MundoLengua on your side, those challenges become positive and quick solutions, so you can sleep at night. In sum, I can only say that all the colleagues and students from the University of Houston that have been to the Centro MundoLengua programs in Cádiz and Seville are extremely satisfied with their performance and we feel that one of the reason why we leave Spain with a big smile in our faces is because Centro MundoLengua is always there for us!”. Guillermo R., University of Houston.